In 1933, after Hitler's rise to power, the paramilitary HitlerJugend, or Hitler Youth, became the only permitted youth organization in Germany, then known as The Third Reich. It’s 1937 now, and a fourteen-year-old German youth, Ernst, is part of a secret mission which will send a group of teen-aged boys to London under the pretense of a bicycle tour to spy for the Nazis. The cyclists’ objective: identify both geographical and human targets for subsequent elimination as Europe approaches a flashpoint that Hitler intends to exploit by waging all-out war. Ernst’s mentor, Officer Müller, considers him the perfect fit for a special assignment—spy on a wealthy British Jewish family considered a threat to the Reich as they shelter Jewish refugees from Nazi oppression. In a parallel story, a modern-day American teen-aged orphan, Clark, has fallen under the spell of white supremacy ideology after a series of family misfortunes. Having lost his mother as a child to cancer and then his father a couple of years later to war in Iraq, he is in the hands of his unscrupulous guardian who manages to plant him as a child-agent in a Muslim household. Clark’s purpose: prove that the randomly-chosen Muslim family must be terrorists. Each youth approaches his assignment with a masked heart filled with hate and a deep misunderstanding of who his hosts are, roiling the boys in emotional conflict as events unfold, and forcing each to face what will be the hardest decision of his entire life—help destroy what his handlers fear or find the courage to think for himself and face the consequences. In the 1930’s, the world was sinking into an abyss of bigotry and imperialism, each flawed concept nudging the other to the brink of global conflict. Eventually, virtually every country in a world awash in propaganda would be drawn into the coda of the Great War that could come to be known as World War II. 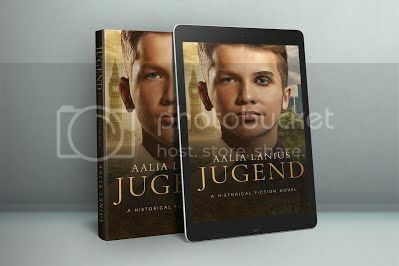 Jugend’s story is wrapped in a little-known, fascinating true story of Hitler Youth trained to spy on England and Scotland in advance of the war the Nazis intended to start, roaming the countryside on bicycles to identify both geographical and human targets for destruction and assassination. In Jugend, a Jewish family becomes the focus of a shameless mission to plant a boy in a household to work an agenda that is far from clear to him. In an eerily parallel story, Jugend also explores modern-day white supremacists in the United States who plant their own child-agent in a Muslim household. Here there is no multi-country alliance and state machinery to support a full-scale assault on decency, but the victims are targeted and the danger is real nonetheless. It’s the story of children caught up in an age-old conflict and used as next-generation guided missiles to perpetuate the agenda of hate. It’s about how far we’ve come and where we need to be. It’s about two individual children out of many who are forced to face moral choices to carry out missions of hate or to break their brainwashing through first-hand observation of those they were expected to revile. As a writer of historical fiction, I am always impressed when the flavor and details of an age are captured in both mood and accuracy; as an educator, I would like to see this particular insightful work in our public schools. With first-class, cinematic workmanship, Jugend provides a magnificent depiction of a course of events in a narrative that never flags or falters. This work, however, not only provides a tale of literary worth, but also occupies a higher plane of value by tackling the most complex aspects of the enduring human condition with both clarity and dignity. Here we find the ugliness and beauty of human nature, and the power and variability of culture to harm or heal. Jugend does not try to address all issues of racism and prejudice, and it shouldn’t. The story is a straightforward one that goes to the core of human understanding where light, tragedy and redemption can be found.